After having a successful campaign in its debut camp programme in Ogun State last year, the ‘Hope 4 Girls’ Basket Foundation programme has invited 55 girls in and around Nigeria to take part in the second camping exercise in Lagos. A brain child of former Nigerian basketball player, Mobolaji Akiode, ‘Hope 4 Girls’ is dedicated to the increased participation and empowerment of disadvantaged young African women in sports and education. Because of the initiative and the desire to help the coming generation of women, Akiode quit her accounting job at American Cable sports company, ESPN and returned to Nigeria to set up the basketball camp to help young girls in the country. She had been a member of the 2004 Nigerian Olympic basketball team. She currently dedicates herself to empowering girls in Africa by lifting them out of poverty through sports. The girls in her camps travel from all over the country to learn not only basketball skills, but life skills as well. “Our target group is young African women particularly Nigerians between the ages of 12 to 19 years. We aim to provide opportunities for these young women to display and develop character, intellect, and athletic ability through ‘Hope 4 Girls’ sports camps, learning workshops, and other empowerment programs” Akiode said. Unlike the first edition made solely of Nigerian girls , this year’s edition will have seven girls from neighbouring West African countries in attendance which to Akiode is a testimony to the success of the programmes thus far. “Girls from Benin Republic, Togo and Guinea Bissau and other countries were begging to be a part of this season’s programme, though some don’t even speak English, we just had to admit a few girls amongst them” she said. 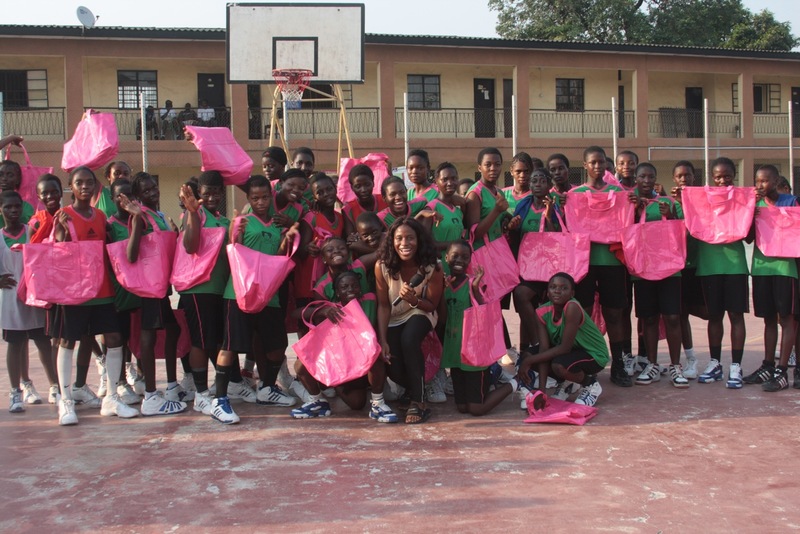 Interestingly also, some NBA Stars are expected to come in to help the girls learn some rudiments of the game. The girls will have the opportunity of learning from NBA stars like Hassem Tabeet; from Tanzania who plays for the Memphis Grizzlies. He will be joined by the new Nigerian sensation; Solomon Alabi of the Toronto Raptors, and Massai Ujiri; all part of the NBA basketball without borders team heading for Senegal. Explaining her reason for deciding to help out the girls on the court, Akiode said that her exposure during her playing career lead her to the present choice of assignment. “I want to see more girls pursuing an education. I want girls to believe in themselves. I want them to be inspired to be great. We want to use the platform of sports to help these young girls find their way out of their undesired situations and grow to be inspiring women. That’s our goal for not only the girls of Nigeria but girls all over” she said. According to Akiode some of the players who participated at the last edition of the programme have already been offered scholarships in some colleges in the United State while she is also hoping that more will be selected to pursue not only a career in basketball but also in academics. The clinic will run in Lagos from Wednesday, July 28- August 1, 2010.